Ukraine has placed its troops on full combat alert, as MPs in Kiev are set to approve President Petro Poroshenko’s proposal to impose martial law following a skirmish between the Russian military and Ukrainian vessels near Crimea. The decision to put the Ukrainian armed forces on the highest level of alert came after the Ukrainian National Security and Defense Council of Ukraine (NSDC) supported Poroshenko’s earlier proposal to invoke martial law for 60 days. The move is now awaiting the approval of the Verkhovna Rada, the Ukrainian Parliament, who will be voting on the motion on Monday. 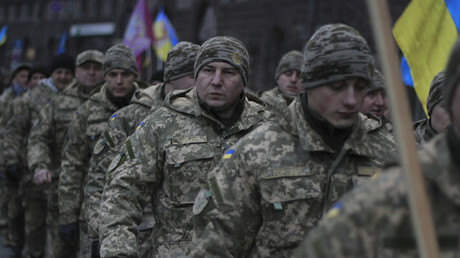 “Based on the NSDC decision to impose martial law, the head of the General Staff – the Commander-in-Chief of the Armed Forces of Ukraine – has ordered to put all units of the Armed Forces of Ukraine on full combat alert,” reads a statement released by the Ukrainian Defense Ministry on Monday.